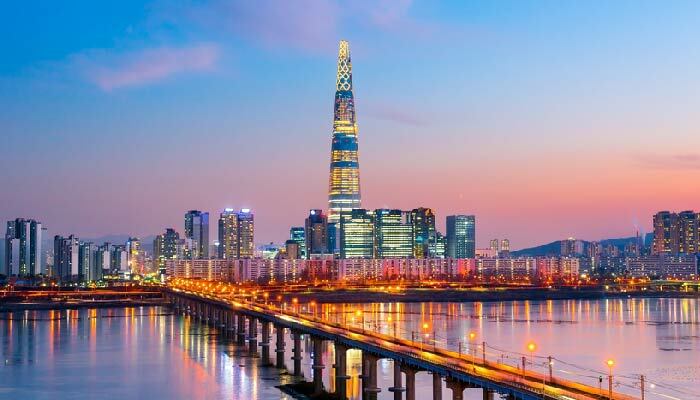 • MedWhat claims its Chinese investors defrauded it of its IP by co-investing with Stanford in MedWhat’s direct competition without disclosing this, failing in its fiduciary duty. • MedWhat states Stanford University and Susan Weinstein frivolously lied to judge in lawsuit about its two Series A investors not existing, Massive Investment and Regent, throwing MedWhat under the bus and damaging company. • Court records show tax-exempt Stanford University employees actively involved in running the for-profit venture capital firm Stanford-StartX Fund LLC. • Contradictions of founder-friendly independent for-profit venture fund and aggressive predatory behavior by tax-exempt University employees actively involved in running and controlling fund in the background. Profit with tax-exempt status. 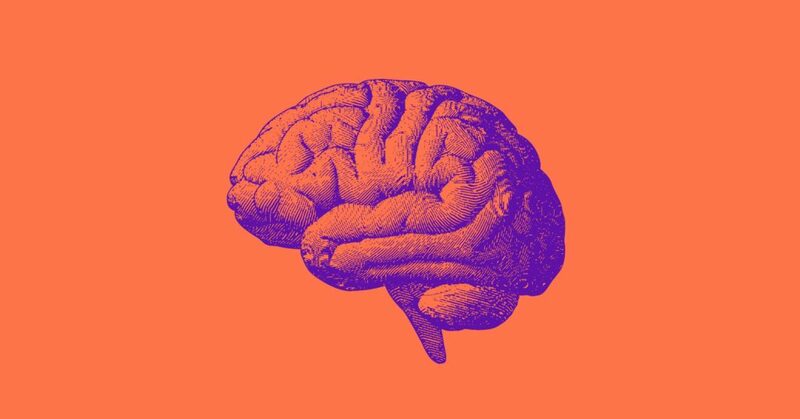 In an escalating ongoing lawsuit in the Supreme Court of California between Stanford University, educational entrepreneur program StartX, and StartX-member medical artificial intelligence tech startup MedWhat, (see here) new information has come out that involves the prestigious University in fraud and sheds light into the university’s seemingly lack of good governance. Non-profit Stanford University, through its for-profit subsidiary Stanford-StartX Fund LLC, filed a lawsuit in April 2018 against StartX company MedWhat asking repayment of its investments in it, plus interest, it made in the form of convertible debt. MedWhat filed a counter suit against Stanford University for fraud. In the lawsuit discovery, MedWhat discovered additional fraud in the form of tax fraud committed by Stanford University and who really ran the fund. Records show MedWhat’s CEO Arturo Devesa was a research scholar at Stanford University School of Medicine from 2016-2017 and member of StartX since 2013. Records also show Devesa did medical ontology research and applied for NIH grants on behalf of both MedWhat and Stanford University Medical School in 2012. Recent court documents show that Stanford University and its endowment Stanford Management Company state that Suzanne Fletcher is not the actual fund manager and decision maker of the alleged independently run for-profit venture capital Stanford-StartX Fund LLC. Stanford University lawyers say Stanford and its endowment are. MedWhat states Stanford have self-incriminated in tax fraud. The for-profit venture capital firm Stanford-StartX Fund LLC. was created as a joint partnership by non-profits StartX, Stanford University, and Stanford Hospital & Clinics with the social mission to help support the entrepreneurial endeavors of Stanford students, faculty, alumni and staff. Making investments in technology. 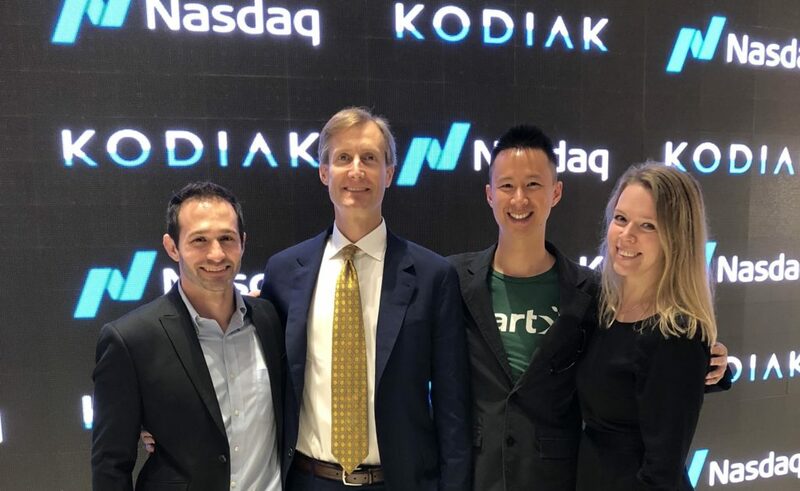 StartX and its founder Cameron Teitelman initiated the creation of the Stanford-StartX Fund LLC to invest in member companies, with a mission stating “We’re determined, focused and innovative, guided by our principle of putting founders first, and driven by our mission to advance the personal development of founders”. 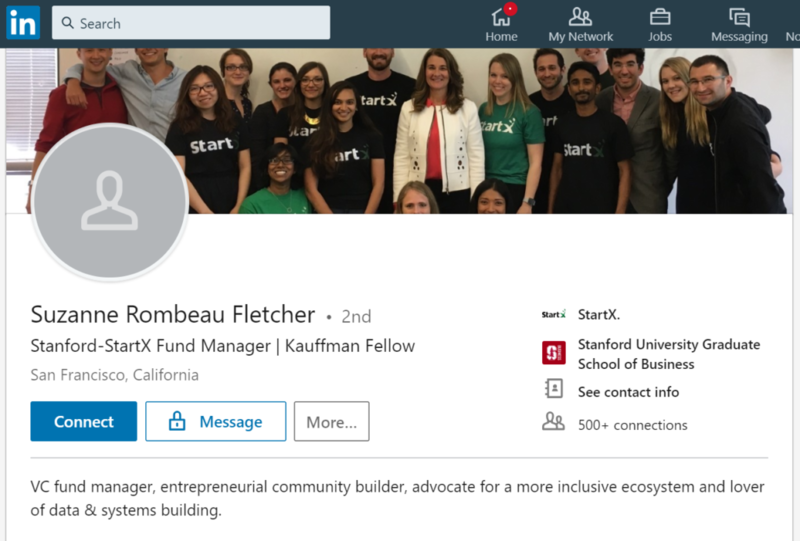 Startups were told the Stanford-StartX Fund LLC was run by Suzanne Fletcher since Stanford University was a non-profit who couldn’t get involved in running for-profit activities. Court documents show this was far from reality, with heavy illicit involvement in for-profit venture capital out of Stanford premises. MedWhat goes on to state in the lawsuit that not only was Ms. Fletcher always advertised at StartX and all over the news and internet as such, she represented the fund as manager with a founder friendly mission first, with clear separation of powers from the University, and a decision maker of the independently fund created by StartX. Suit states Sabrina Liang, Director of School and Department Funds, at the Stanford University endowment Stanford Management Company, under direction of Suzanne Fletcher, signed MedWhat’s conversion of notes into equity shares. Based on statements by Stanford’s lawyers and court documents provided by MedWhat, it seems the University wasn’t aware of the endowment’s signatures of the investment note conversion it sued about. It’s not clear if Stanford was frivolously lying in lawsuit about not signing conversion in order to damage MedWhat or incompetent in filing a lawsuit about notes without having records of approved conversion. Stanford University’s law firm representing in its case, Alto Litigation, and its attorney Bahram Seyedin-Noor, seem to have inadvertently revealed information that involves Stanford University in tax fraud. 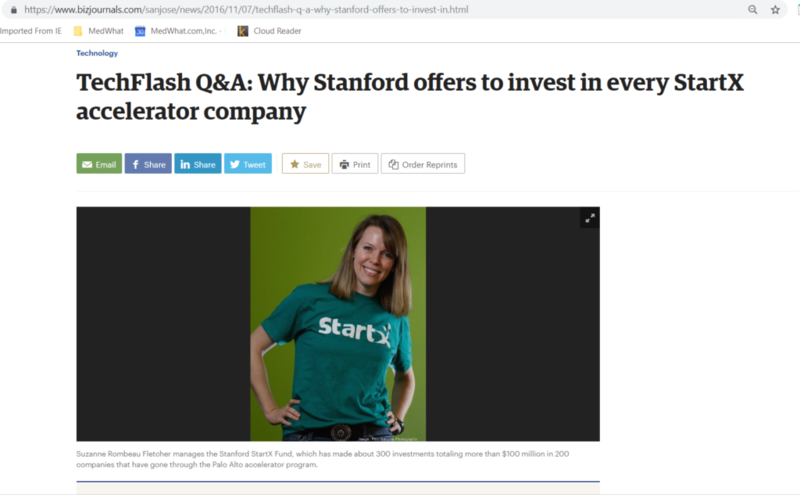 Stanford seems to validate the notion that the Stanford-StartX Fund is not independently ran by StartX, Stanford-StartX Fund and Suzanne Fletcher, but instead by Stanford University and the endowment. Troubling documents provided by MedWhat show that all investments and bank wires came not from an entity called Stanford-StartX Fund LLC, but from official Stanford University tax-exempt bank accounts under the official university name – The Board of Trustees of the Leland Stanford Junior University – with the address for the bank account originator as Stanford Management Company, 635 Knight Way, Stanford, CA 94305. Stanford University’s website show 635 Knight Way as the address for Stanford Graduate School of Business inside the campus premises. MedWhat claims Stanford University employees gave instructions to MedWhat at time of investments of never using the university’s name or logo as an investor. The university is a tax-exempt entity under section 501(c)3 of the Internal Revenue Code and from California state income tax as an educational institution under the Revenue and Taxation Code (R&TC) Section 23701d. An article on Stanford University website states “Stanford continues to enforce name and emblem use policies to protect the integrity of the university’s research and teaching mission, said Lisa Lapin, vice president for university communications. Court records show email correspondence between MedWhat and Stanford-StartX Fund LLC included Stanford University employees. Is not clear if Stanford-StartX Fund LLC has its own employees or offices. There are no records of Stanford-StartX Fund LLC having wired funds for each of the four investments in MedWhat or the Stanford-StartX Fund having its own bank accounts or its own independent directors. 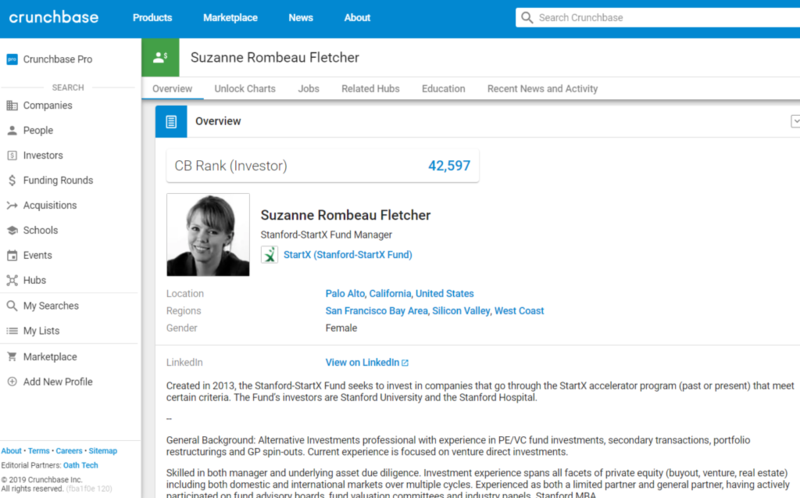 The only person that online public records show is accountable for managing the fund and to be a director is Stanford-StartX Fund LLC fund manager Suzanne Fletcher which is mentioned by the Stanford endowment in the lawsuit as not being the person responsible to make fund decisions. Online records seem to indicate that the Stanford-StartX Fund LLC, a Limited Liability Corporation, is a shell company financial vehicle registered in the State Delaware Division of Corporations, with Stanford University General Counsel Debra Zumwalt at Stanford University, Bldg. 170, 3rd Floor, Stanford, CA 94305 as the registered Agent for Service of Process. There are no online records showing the Stanford-StartX Fund LLC as having independent offices or employees or directors or email addresses; instead only Stanford University offices, only Stanford University and endowment employees and only @stanford.edu email addresses appear in all court documents. When it comes to tax-exempt non-profits creating a for-profit subsidiary, under IRS tax laws, corporate formalities must be observed to protect the separation of the entities. Otherwise the non-profit can lose tax-exempt status. Each organization must have a separate governing body and should conduct separate board and committee meetings, with separate minutes taken. The entities also should avoid commingling assets by using separate bank accounts and should maintain an arm’s length relationship. If the subsidiary and the parent will share any resources such as office space or employees, or if one entity is going to provide goods or services to the other, or a license of any intellectual property, the entities should enter into a written resource-sharing, services, or licensing arrangement. A charity must receive at least fair market value for whatever it provides to the for-profit entity. Even more troubling is multiple evaluations of Stanford University’s Form 990, Income Tax for non-profits, which states the University doesn’t have any partnerships, which contradicts with Stanford Univesrity’s management and its employee’s involvement with operations of the subsidiary for profit Stanford-StartX Fund LLC. MedWhat’s evidence in court and public records seems to indicate Stanford lied to the IRS in its Form 990. 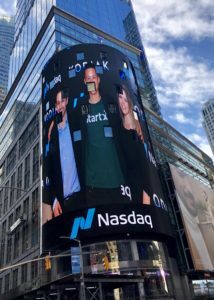 Online records in Silicon Valley Business Journal newspaper, Crunch databases, Ms. Fletcher’s LinkedIn profile, and StartX advertisements show Ms. Fletcher as the active fund manager for years; StartX shows Fletcher in a StartX company IPO debut on the NASDAQ in 2018 as such manager. However, Stanford University lawyers goes on record saying Fletcher has no authority in fund matters. Court records indicate that Stanford University and its Stanford Management Company $27 billion endowment are the actual active entities in charge of venture capital Stanford-StartX Fund LLC and who made decisions whether to convert MedWhat’s convertible promissory debt note it had lent to MedWhat at 5% interest for future stock equity conversion. MedWhat claims all of this is fraud and misrepresentation by Fletcher, StartX, Stanford-StartX Fund LLC, and Stanford University. Devesa goes on to say “I have only dealt with Suzanne Fletcher as the manager of the Stanford-StartX Fund. Stanford University employees portrayed themselves always independent of StartX and the Fund and only involved in wiring of funds and signing of documents during these investments in my for-profit commercial entity. They always told us Stanford doesn’t run the fund and to never use the Stanford name or logo”. Court records show Stanford-StartX Fund LLC fund manager Suzanne Fletcher being represented by different lawyers than those representing Stanford-StartX Fund and Stanford University as the university is worried about the conflict of interest in public courts. Court documents show that Stanford University kept an arm length distance in public in StartX companies it had invested through the Stanford-StartX Func LLC for tax purposes related to the University not being allowed to be involved directly in for profit venture capital. However, MedWhat claims Stanford University and its employees ran the show. • to not use Stanford’s name or logo, and voiding implying that the Stanford-StartX Fund LLC had made a judgment about the company’s future by its decision to invest. A Securities Exchange Commission (SEC) search in the Edgar database provides zero results for the Stanford-StartX Fund LLC with no sec filings found. Most of StartX invested companies also don’t show an SEC filing. In the use of a for-profit subsidiary by a nonprofit organization, Internal Revenue Service (IRS) federal tax laws state entities cannot commingle assets, cannot use same bank accounts and should maintain an arm’s length relationship. Court records indicate Stanford-StartX Fund LLC and Stanford University are the same entity. While the nonprofit parent is the only (or at least the controlling) equity holder of the for-profit subsidiary and therefore will control the for-profit’s governing body, it appears Stanford didn’t avoid complete overlap in the directors and officers of the two entities. According to the IRS, having some different directors and officers helps clarify when individuals are acting on behalf of the for-profit subsidiary versus the nonprofit parent; these lines can get blurred more easily if the directors and officers of both are identical. In addition, for transactions between the two entities, it may be desirable, or even required, for the nonprofit to have some board members who are not affiliated with the for-profit entity to approve the transaction. MedWhat claims unconscious incompetence and conscious incompetence by Stanford University and its endowment in handling of the convertible notes and conflicts of interests with some of MedWhat other investors. Stanford-StartX Fund and MedWhat investor Magic Stone appear on Crunchbase as investors in MedWhat direct competitor Sensely. MedWhat also claims Stanford University frivolously filed suit against it without verifying the facts of MedWhat’s notes, Series A and its investors. Stanford Daily News reporter Sean Chen discusses on March 9th 2018 issues related to Stanford University and its endowment. In its last meeting of winter quarter, the Faculty Senate considered the Stanford Management Company’s (SMC) investment practices and usage of the Stanford name and emblem. SMC Chief Executive Officer Robert Wallace came to the Faculty Senate on Thursday to report on the workings of the SMC and clarify the SMC’s position on issues such as divestment. Stanford University’s endowment and how it in the context of current calls for divestment from student groups, Wallace said that the SMC’s divestment policy is currently under review by Stanford’s Board of Trustees. Civil and environmental engineering professor Jeffrey Koseff also posed a question about whether the SMC should make use of Stanford’s economic resources to be a positive agent for social change. Regarding investment transparency, Wallace stated that the SMC maintains full transparency with its Board of Directors. The SMC’s Board of Directors is determined by the Board of Trustees and includes President Marc Tessier-Lavigne. ASSU Senator Aamnah Khalid ’20 followed up with a question about why the SMC does not make its operations transparent to the public. The Faculty Senate also saw a presentation on preserving the integrity of the use of Stanford’s name and emblem. Vice President for University Communication Lisa Lapin, Senior Director of University Brand Management Nicole Scandlyn and Assistant Vice President for Business Development Susan Weinstein, discussed the regulations in place regarding Stanford’s brand in addition to cases of its misuse. The presenters highlighted many specific instances where private entities used Stanford’s brand without following proper procedure or receiving permission. “When you see film crews on campus that look suspicious, it’s fine to call [the Office of University Communications],” Lapin said in reference to a recent case of a film crew operating without proper permission in the McMurtry Building. The presenters also emphasized Stanford’s general aversion to associating its brand with corporate and commercial material. “The University name and logo are allowed to be used by any organization that’s officially sanctioned by Stanford,” Weinstein said. Stanford Management Co. reported a net 13.1% return for the year ended June 30, 2017 according to a news release from Stanford University. “Certainly one consideration early from the “well, we could make money, why not put a piece of the endowment into a venture fund?”—because the money has to come from somewhere. The money managers say, “Why would we put our money into a single fund when we can take a piece of the endowment that, in terms of portfolio management, would be in higher-risk, higher-return ventures, and pick the best venture funds in the world and invest a little in each of them so we’re not constricting ourselves on deal flow.” [That’s the consideration] if it was just about the money.